For the sake of convenience, we recommend starting with a frozen turkey. Plan to head to the store at least five days before you roast. The earlier you shop, the better your choices will be. When choosing a frozen turkey, size matters. A typical 14-pound bird serves 16 people. Want to assure yourself of those valuable leftovers? Add an extra pound or two. Kitchen tip: This is a smart time to start gathering ingredients for stuffing, cranberry sauce and green bean casserole. What ever side dishes you plan to serve with the turkey. Don’t forget to thaw! Every 4 pounds of frozen turkey will need 24 hours of thawing time. For a 14-pound bird, plan on pulling the turkey from the freezer five days before the big feast. Move it to the fridge for safe thawing. Set yourself up for success with this brilliant tip. While the turkey is still in its packaging, devise an oven shield out of aluminum foil. (This will help protect the bird from overbrowning when it comes time to roast!) Mold a few sheets of foil around the breast area, then set aside in a safe place until roasting day. Peel the bird from its packaging and remove all of the giblets (those meaty pieces) from inside the turkey. They tend to hide out deep inside the bird. Next, remove and toss any large pockets of fat along the neck area. Now the fun starts: Give your bird the rubdown with an ample amount of salt (preferably kosher). Massage it all over the outside of the turkey. This is the secret to getting that extra-crispy skin we all crave on the holidays. Return the bird to the fridge when you’ve finished. At last, the big day has arrived! Plan on starting the turkey recipe at least four hours before you sit down for dinner, or earlier depending on the size of your bird. 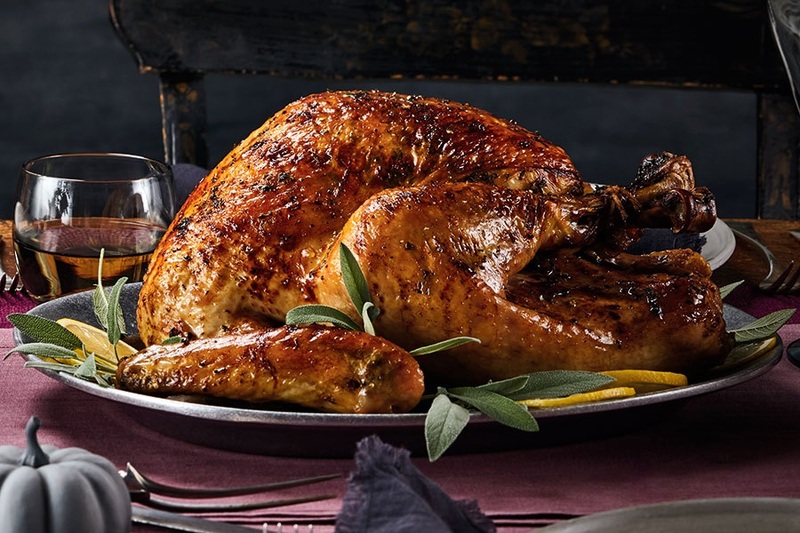 We’ve found it best to start by roasting turkey at a high temperature (425°) to help speed up the cooking time. (This also helps to make the legs and thighs extra crispy!) About 40 minutes in, we’ll reduce the oven temperature to 325-350° for the remainder of the roasting time. Then finally, let it rest to soak up the juices before slicing! GOOD LUCK! AND ENJOY YOUR THANKSGIVING!